Underwater gliders are autonomous underwater vehicles (AUVs) which enable oceanographic studies over time and spatial scales which are impossible to carry out by ships. Gliders move horizontally and vertically simultaneously in a saw tooth manner as shown in Figure 1, while also taking important sea measurements by the use of sensors aboard the vehicle. An underwater glider is generally about 1.5-2 metres in length, and weighs about 50 kg in air (Rudnick, Davis, Eriksen, Fratantoni, & Perry, 2004). These vehicles are designed to be very energy-efficient and therefore propulsion is provided by what is known as a buoyancy engine, whereby upward and downward vertical displacement is provided by changing the volume of the glider (Rudnick et al., 2004), i.e. 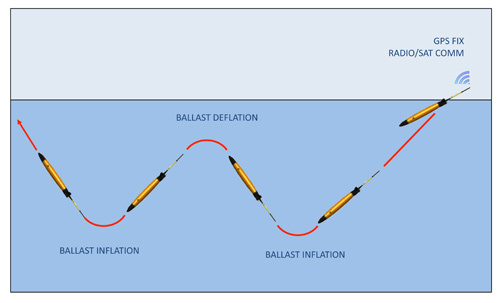 a decrease in volume of the vehicle results in a reduced volumetric displacement of seawater, and hence the glider sinks; conversely, an increase in volume results in a higher amount of displaced seawater, and therefore the glider rises. This is achieved by means of hydraulic pumps that use hydraulic oil to inflate and deflate a bladder, which changes the volume and consequently the buoyancy of the glider. The bladder is depicted in the illustration shown in Figure 2. Pitch control is achieved by changing the position of an internal mass (batteries) (Davis, Eriksen, & Jones, 2002) so that there is a resulting pitch moment which changes the attitude of the glider, i.e. the glider’s nose points towards the seabed when the mass is moved to the front (fore), and conversely it points towards the sea surface when the mass is moved to the rear (aft). A glider also has two wings which provide it with lift, meaning that both during ascent and descent, it moves forward. A symmetrical hydrofoil does not generate any lift if the angle of attack is equal to 0. The lift force increases as the angle of attack increases, until it reaches a critical value known as the critical angle of attack (Wikipedia, 2016) (also known as the stalling angle of attack) where no further increase in lift is possible. On reaching the stalling angle of attack, water is not capable of following the wing’s contour, since the fluid cannot make such a sudden change in direction of flow. This brings the separation point of the fluid flow forward, causing flow separation to occur closer to the leading edge of the hydrofoil, and hence increasing turbulence. Ocean stratification – if there is a strong pycnocline, such as in the area of the Maltese Islands more energy is consumed by the glider to penetrate the buoyancy change; conversely weak stratification is not as energy demanding, and hence results in an increased range. Gliders would not be able to take any measurements without having sensors on-board. Ocean properties which are commonly measured by gliders are temperature, salinity, density, dissolved oxygen and chlorophyll fluorescence. Gliders are important for academic research and, indeed, virtually indispensable in any situation where it is not practical to have human divers take certain underwater measurements at different locations. Data acquired from gliders can also be incorporated into models to give more accurate forecasts of future ocean states. In April 2017, the Physical Oceanography Research Group gained access to a SLOCUM glider to monitor marine areas around the Maltese Islands. 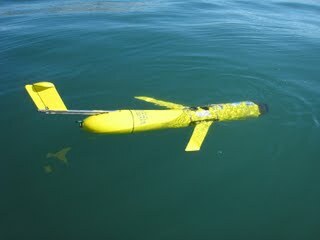 Slocum is a brand of underwater gliders developed by Teledyne Webb Research, a United States company based in Massachusetts. The glider was made available by CNRS-INSU through a JERICO-NEXT trans-national activity. 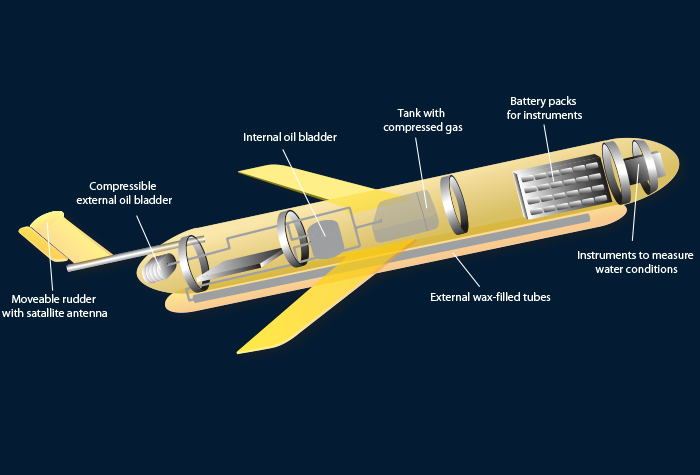 An important aspect of any underwater glider is the type of energy storage device. SLOCUM gliders, such as the one shown in Figure 3, are designed to use either alkaline batteries or lithium thionyl chloride batteries. The former have an energy-per-unit mass which is roughly half that offered by lithium batteries. 60-70% of the stored energy is used to propel the vehicle, whilst the remaining 30-40% is roughly split in half between communications, and the on-board functions of the microprocessor controller and sensors (Rudnick et al., 2004). SLOCUM gliders have an aluminium hull (Rudnick et al., 2004), meaning that the structure is strong and robust enough to withstand external pressure, and yet at the same time it is easy enough to manufacture the material into a streamlined hydrodynamic shape by using computer controlled machining. An important characteristic of underwater gliders is the ability to communicate location and measured data via Iridium/GPS antennae. Iridium antennae can transmit and receive information over a network of satellites that form part of the Iridium constellation. Gliders do not transmit data all the time. They only do so when they are at the surface. To do so, the antenna must be above the water surface. SLOCUM has a tail section which includes the GPS/Iridium antenna and the rudder that controls the yaw of the vehicle. Therefore, the antenna can be made to clear the water surface (as shown in Figure 3) by adjusting the glider’s pitch, i.e. by pitching down the glider. SLOCUM gliders can also communicate through Local Area Network (LAN) when it is within 40 km of a receiving station. LAN allows for higher data transfer rates (more than 30 times as high as that provided by Iridium communication – 5.7 Kbytes/s compared to 180 bytes/s) whilst also consuming much less energy to communicate the same amount of digital information (almost 12000 times the energy savings for the same amount of information when compared to Iridium – 3 J/Mbyte compared to 35 J/Kbyte) (Rudnick et al., 2004). SLOCUM gliders change their heading by adjusting the yaw angle by the use of a rudder which is part of the tail section. Such a feature permits these gliders to have a tight turning circle ( about 7 metres) (Davis, et al., 2002). Since gliders only communicate when they are at the water surface, their location while submerged has to be estimated by using an algorithm. SLOCUM gliders use a simple algorithm which does not take into account water currents, but only includes the most recent GPS fix while pitch, heading and angle of attack are assumed to be constant during transit (Webb, Simonetti, & Jones, 2001). This rather simplistic way of determining the vehicle’s position is known as dead reckoning. Davis, R. E., Eriksen, C. C., & Jones, C. P. (2002). Autonomous buoyancy-driven underwater gliders. The Technology and Applications of Autonomous Underwater Vehicles, 37-58.